We know visiting a new church can be overwhelming. Here's everything you need to know on your first visit to Providence. Not sure where to start? Pick a service time that works best for you. 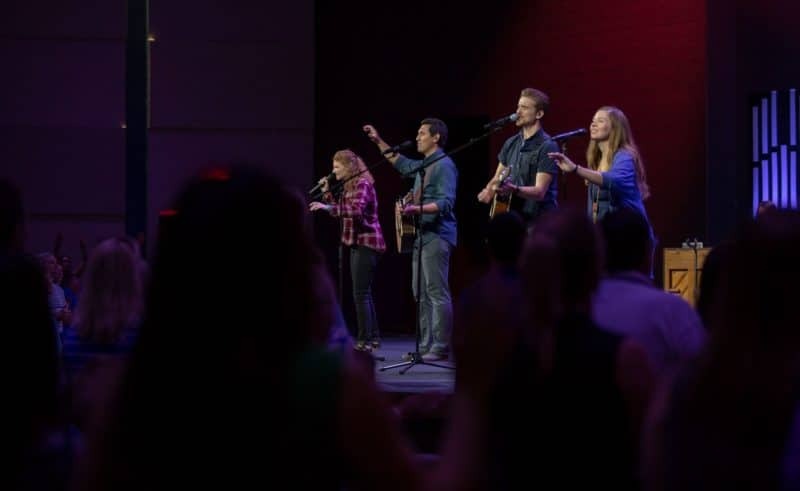 No matter which service you attend, you’ll get a similar worship experience. Check out What To Expect below for even more details on your visit. We hope to see you this Sunday! Is anyone able to attend a service? Yes. Sunday morning worship services at Providence are open to all regardless of age, gender, religious belief, disability, handicap, race, or ethnicity. What does Providence offer for kids and students? Kids are an important part of Providence. We provide quality care in a safe and secure environment, where sharing the love of Jesus is our main goal. We offer nursery and preschool for birth – 4 years old during all three services. Classes for elementary aged children are available at the 9:30 and 11 AM services. When you arrive, stop by the Guest Tent at the Main Entrance or the Welcome Desk in the Main Lobby. They will guide you to our Kids Lobby where you will use our electronic check-in system. Please plan on arriving 15 minutes before your desired service so that you won’t miss the start of the service. Learn more about Providence Kid’s here. We have a special team to serve you and your child. We’ll work with you to provide the appropriate level of assistance needed for your child so they can learn about Jesus in a loving and safe environment while you attend worship service or Life Group. Visit the desk in the Kids Lobby when you arrive or contact Cindy at [email protected] before you come. We offer solid, practical biblical studies in an engaging atmosphere for middle school students at 9:30 & 11 AM and high school students at 11 AM. Middle school and high school students meet by grade on the third floor. Stop by the Guest Tent at the Main Entrance or at the Welcome Desk in the Main Lobby for assistance locating the elevators to the third floor. Learn more about Providence Students here. Dress comfortably. We want you to be at ease. Most of our attendees wear smart casual, but we cover the spectrum. No matter what you wear, you won’t be alone. Providence offers special parking for our first and second-time guests. When you arrive, please enter from Glenwood Avenue. Flash your hazard lights and a parking attendant will direct you to Guest Parking. If you have any questions feel free to ask anyone in an orange vest. Guest parking is conveniently located near the Main Entrance. After you park in Guest Parking, look for the blue tent at the Main Entrance. Anyone at this tent can help lead you where you need to go and answer any question you may have about your visit. Where can I sit in the Worship Center? You’re free to sit in any available seat. If the service has already begun and you need assistance finding a seat, an usher will help guide you. What can I expect to happen in a service? Each 70-minute service is made up of a combination of music, teaching, prayer, and other special elements throughout the year. Each morning’s set list is designed to lead you into worship and to think deeply about the many great truths about God. You are encouraged to stand, sit, raise your hands and sing your heart out! Our Senior Pastor, Brian Frost preaches the majority of our services. Regardless of who preaches, the sermon is based on the same Bible verses for all three services. Preaching is usually around 40 minutes. On the first Sunday of every month, we take the Lord’s Supper together. This time is designated specifically for followers of Jesus. We would ask that if that does not describe you that you do not participate. If you have questions please reach out to someone with an ‘ASK ME’ badge in the lobby. Baptism takes place on various days throughout the year. Learn more about baptism here. If you have questions about what you heard during service or are interested in learning more about how to connect to Providence, stop by Next Steps in the Main Lobby. Our team will be happy to assist you. No pressure. Check us out online first. Our services are streamed live on our website and on our Facebook page.